In 2007, the Optimus Maximus keyboard was all the rage on gadget-oriented websites. In place of traditional plastic keys, this pricey, programmable keyboard used special keys with a tiny OLED screen on each. The idea was that you could customize each key to perform whatever task you wanted, and give that key a custom appearance to make it easier to find that function. The Optimus Maximus was more a clever idea than a successful product, but it was interesting because we often wish our keyboards had a few extra keys for performing particular tasks. Many of us get around this limitation by using macro utilities such as Keyboard Maestro, but those require you to remember keyboard shortcuts, or use menus, or use some other onscreen mechanism for accessing those macros. Lately, I’ve been using my iPad as a poor man’s version of the Optimus Maximus (if you can call anything requiring an iPad a “poor man’s version” of anything) thanks to Actions. Unlike most Mac Gems, Actions isn’t just a Mac app. Rather, it’s a combination of a free Mac app called Actions Server and a $4 iPad app called Actions that, together, let you use your iPad to control your Mac and automate Mac tasks. The Mac side of Actions is pretty bare-bones. Launch it, and its icon appears in your menu bar. That menu shows which iPad is connected (see below) and provides access to a few simple settings. Those preferences let you designate any folders, in addition to /Applications, in which Actions should look for apps (to make them available in the iOS app). You can also change the network port over which your Mac and iPad communicate should your firewall prevent the default port from working. That’s essentially it for the Mac app—the real work is done in the iOS app. 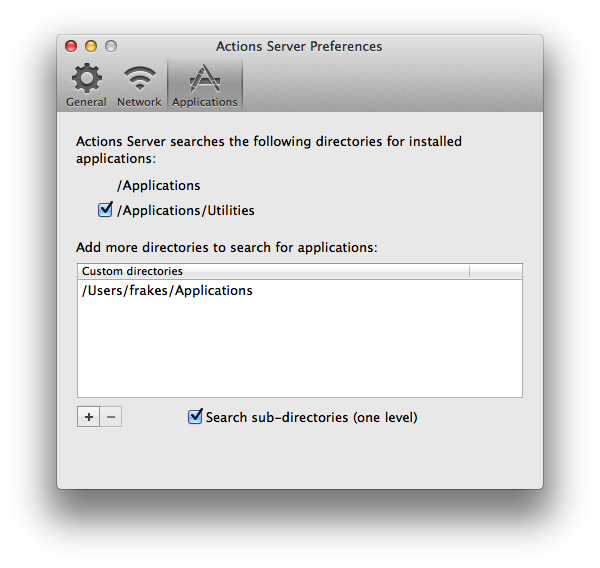 Launch that app on your iPad and it searches your local network for Actions Server running on your Mac. You’ll be prompted to enter, on your Mac, the four-digit code that appears on your iPad. Once this initial setup process is complete, your iOS device and Mac will connect automatically in the future. The app starts with a few example buttons, but every button is completely customizable: Just tap the edit (pencil-icon) button in the top-right corner to enter edit mode. In edit mode, you can drag any existing button to move it, tap its X button to delete it, or tap the button itself to edit it. But the fun part is the Create/Load button. 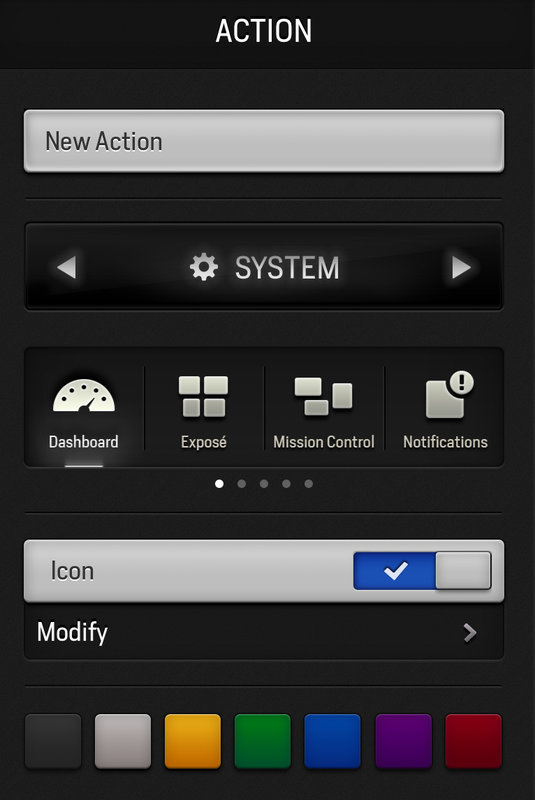 Tap Create to create your own action, or tap Load to add one of Actions’s built-in actions. Keyboard shortcuts: Any combination of one or more modifier keys and a key on the keyboard. Even better, you can choose the application to which each shortcut is sent. Actions will execute the shortcut in the correct Mac app, even if that app is in the background. Text snippets: Bits of text you frequently type. A nice touch here is that if you want to use a block of text that's on your Mac, just copy that text to the clipboard, and then tap the tiny downward-pointing arrow at the bottom of Actions’s text field—your Mac’s clipboard is pasted into the snippet. 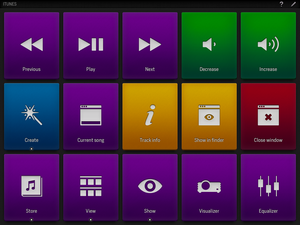 Media controls: Play/pause, previous, next, mute, volume down, and volume up. System actions: Dashboard, Exposé, Mission Control, Notifications, Launchpad, show Desktop, empty Trash, activate screen saver, sleep, restart, shut down, power button, log out, lock screen, force quit, eject, display brightness up and down, and key backlighting up and down. 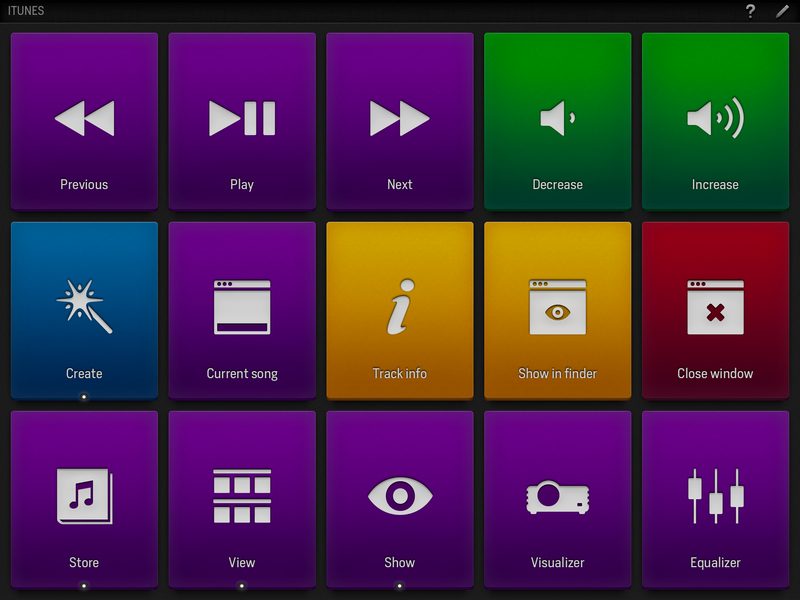 Window/app controls: Hide current app, other apps, minimize or maximize the current window, resize that window to a particular screen section (left half, right half, top half, bottom half), or close that window. Webpage: Quickly open a particular URL. Email: Create a new email message in Mail. You can optionally choose to prefill To and CC recipients, the message subject, and/or the message body, with the body field offering the same Mac-clipboard-paste arrow described above. 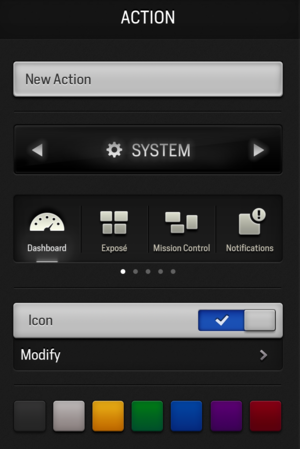 When creating an action, tap the Modify button under Icon and you can choose a button icon from Actions’s large library. The selection is good, with roughly 900 choices divided into categories, though I wish you could import your own images for use as icons. I’d also like to be able to use a website’s favicon for webpage actions. Actions also includes a slew of built-in actions you can use instead of creating your own. 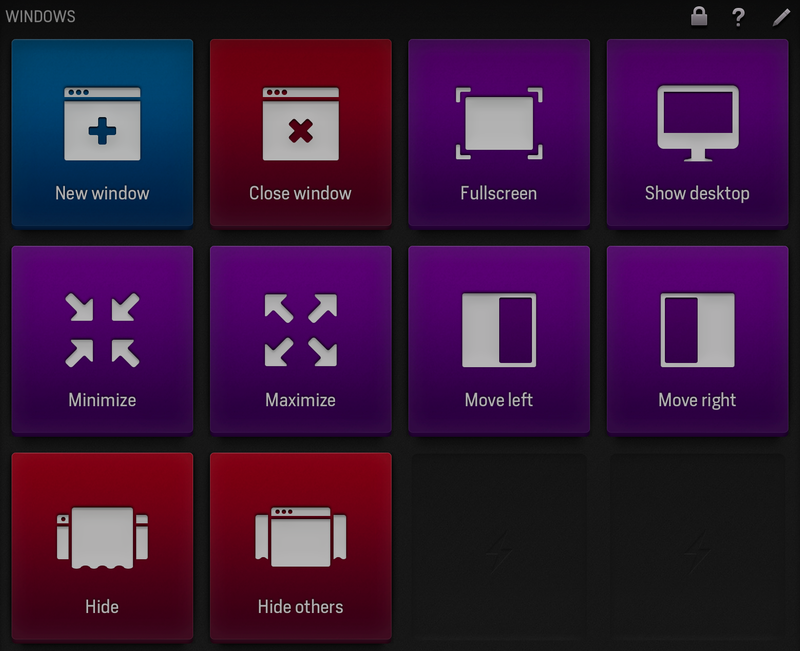 Enter edit mode and tap Load, and Actions presents you with a list of supported apps. Tap an app to view a list of available actions. 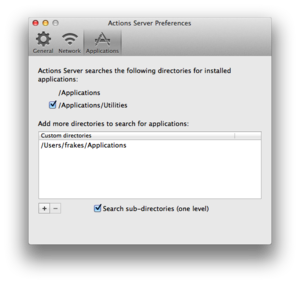 (Oddly, given that Actions knows which apps are installed on your Mac, the app list includes all supported apps, even those you don’t have.) 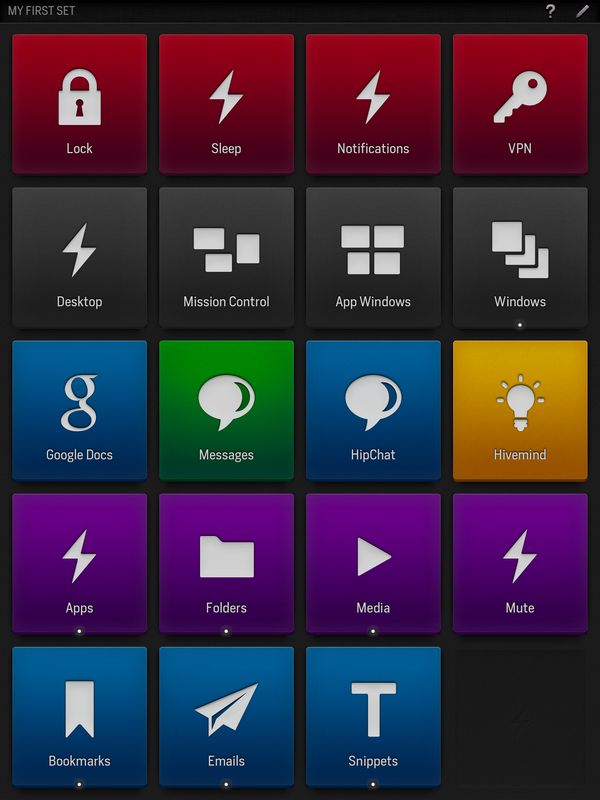 Many of these actions are simply menu commands, but depending on the app, Actions may provide additional options. Tap an action, then tap the checkmark button to confirm. Your new button appears on the screen, complete with icon and text description. You can of course edit a preset button just as you would any other. To access actions contained in a folder, tap the folder to reveal its contents. You can have any combination of folders and standalone actions on your screen. But that’s just your main screen—called a set—of actions. Swipe down with three fingers, or tap the set name in the top-left corner, and you can create and edit additional sets. For example, you could have one set for general computer actions, another for Safari-related actions, another for Mail, and yet another for Photoshop. Finally, Actions offers a few useful gesture actions that are easy to overlook: Swipe up with two fingers to copy whatever is selected on your Mac, or swipe down to paste. Similarly, a two-finger swipe to the left executes an Undo command on your Mac, while swiping to the right is Redo. These are systemwide actions that work in whatever Mac app you happen to be using. If you plan to use Actions with multiple iPads, you can enable Dropbox syncing on each to keep your sets synced between devices. However, I found that while this feature worked for syncing secondary sets, my main (first) set didn’t sync properly—each iPad continued to keep its original main set. In addition to the minor complaints I mentioned above, I found that with a lot of apps installed on my Mac, choosing an app (say, for a keyboard shortcut) can be frustrating, as you must scroll through the entire app list. You can’t type the first letter or two of an app’s name to quickly reveal it. The same frustration arises when looking for an icon for a button. With 900 choices, it takes a lot of time and scrolling to find, say, a padlock icon for your Lock Screen action. (The included icon categories don’t always make it easy to find a particular icon.) Finally, in my testing, Actions occasionally crashed when I was creating a new button/action. Those issues aside, Actions is a clever way to get easier access to common tasks and actions. It makes your iPad feel like an extension of your Mac. It’s especially great for people who want macros but don’t want to have to remember a bunch of keyboard shortcuts or fill their Mac’s screen with a DragThing-like button window. If your iPad usually sits unused when you’re working on your Mac, why not put it to use? Together with its iOS counterpart, Actions lets you use your iPad to control your Mac and automate tasks. Together with its OS X counterpart, Actions lets you use your iPad to control your Mac and automate tasks.